Perched on the same ground as the Fort Museum, the St Mary's Church is not only the oldest Anglican church but also the oldest British building in India. With a striking architecture, the church remains to be a debate of who the architect was. Whether it was Edward Foule or William Dixon, both who were gunners of the fort. The church’s’ construction is believed to have taken place in the 16th century, most probably in the years of 1678-1680 AD. 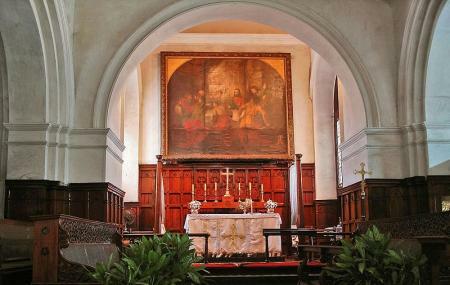 The British East India Company played a leading role in the inception of this church. One of the most beautiful churches in Chennai, this church is certain to make you feel mesmerized and calm! How popular is St Mary's Church? People normally club together Fort St George and Tirumala Tirupathi Devasthanam while planning their visit to St Mary's Church. People also prefer to start their day with St Mary's Church. Oldest church.I will go to this place whenever I feel confused and I hope that my I will get stress free once I go there. Parking facility is available. Calm place Atleast for 1 time everyone should go to this church. One of best and oldest Church of sixteen century, protected by Arechology department. Well maintained and in best condition n use for prayer.